Employee Monitoring. Best Computer Monitoring Software. Let's talk about employee monitoring and how it can help. The main task of every company is to boost profits and reduce expenses. Without a doubt, one of the leading components of company's success is employees. How to improve their productivity. One of the solutions is to use employee monitoring software and restrict non-work-related activities such us instant messengers, online games, blogs, social networks, etc. We want to introduce you our best employee monitoring software HT Employee Monitor. It contains all monitoring features and let you record every computer activity and block inappropriate ones. Do you know what your employees are doing in the workplaces? Do they work diligently when the boss is not around? Do they use the Internet and workstations just for work? If you want to improve discipline and productivity, you should think of employee monitoring. Install HT Employee Monitor and let your employees know that all their computer activities are recorded. Just knowing that they're monitored, employees work more efficiently. Statistics confirm that computer monitoring improves employees' discipline and productivity. 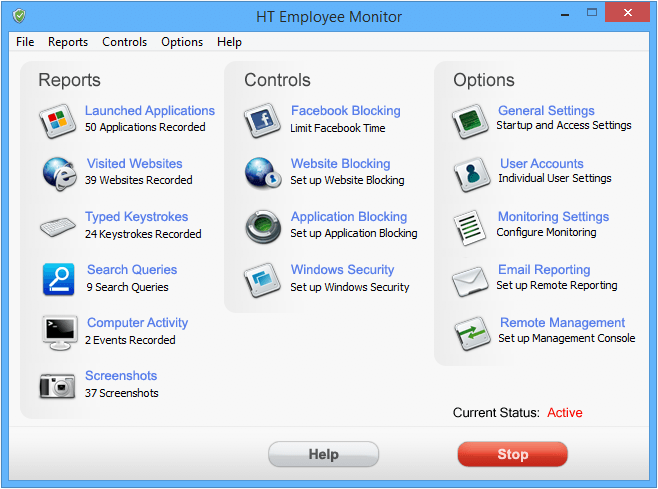 HT Employee Monitor provides a large array of essential computer monitoring features. This productivity monitoring software records logs of all visited websites, launched programs, and screenshots. So you can watch EVERYTHING that an employee is doing on his computer. Another computer monitoring feature allows you to track the amount of time an employee spends away from the computer or idle time on the PC. You even don't need to access employees' PCs. Our employee tracking software can automatically send reports to your email address or allows you to access the monitored computer from yours. Remote Monitoring lets you monitor your employees from any place where you can check your email. Our employee monitoring software can be invisible so nobody can detect it or vice versa it can show the warning. First, employee monitoring software helps companies determine if any problem exists and how serious it is. Second, it allows you to stop your employees from non-work-related and harmfulness activities. How is it possible? Very easy. With HT Employee Monitor, you can block unwanted websites and applications. Specify what sites or apps are not allowed in the workplace and they will be banned on the PC. Blocking website category is also available. Block unwanted websites in up to 10 categories. If you don't want to ban sites completely, specify the amount of time that users can spend on them. With blocking features, you can block social networking sites, games, chats, etc., all non-work related activities. Thirdly, monitoring is the strongest guarantee of protection against company's data and secrets theft, because an employer will have a witness. "Employees need to understand that it is the employer's right to protect their business from abuse, including neglect of duties or malfeasance." Our employee monitoring software is a cost-effective method to increase your employee's productivity. HT Employee Monitor allows you to detect problems with employees, prevent information theft, improve discipline and take employees away from idleness and distractions in the workplace. 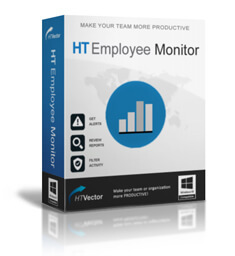 HT Employee Monitor is the best way to increase your employee's productivity! "Our company is quite impressed with your tool. We have used the program for four . I think that says it all. We are satisfied and did not find the product better." "I am a software distributor and want to say that my clients are satisfied with your software. Before HT Employee Monitor I resold other employee monitoring software, but no one of them none of them was so good." "I needed to stop facebook and other sites during working hours. After trying quite a few different programs, I have settled on using HEM as it gives us everything we need. I recommend HT Employee Monitor." "Your soft perfectly copes with its task. Monitoring is at a high level. One of the best employee monitoring software."